If you are using US regional settings on your PC you probably have not come across this issue, but for other regions this can be a problem. After doing some google/binging I found that both Chrome and Firefox have their own internal regional settings dialog and they both default to using US settings. 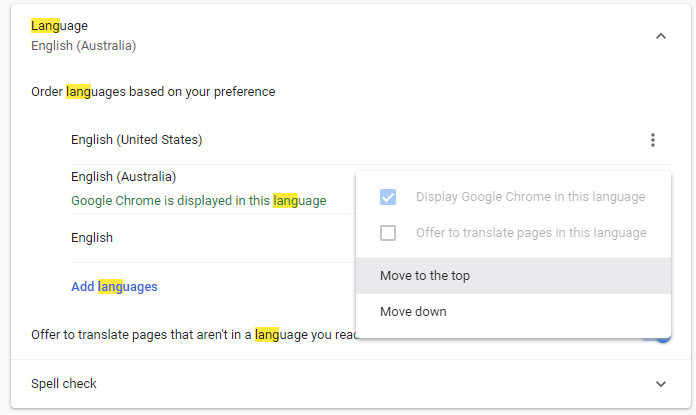 If you go into the Settings menu in Chrome and search for “Language” you will find the following, and it’s not just the default display language that matters the order is also important. Moving “English (Australia)” to the top of the list, then deleting cached images and files fixed this issue. Clicking on the 3 dots to the right of the language gives you an option to move that language to the top. Firefox has a very similar language dialog and the same fix works for it too. I recently updated the documentation on daxstudio.org to include a page on the Parameter Support, but I thought this might also benefit from a longer explanation. It may surprise some people to hear this, but the DAX language has supported parameters in queries since it was first released. 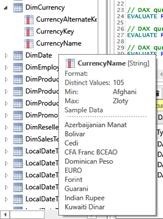 However while you can use parameters in a DAX query you cannot easily test parameterized DAX by supply the parameter values as variables like you can in T-SQL. In DAX the parameters are sent in a separate part of the XMLA as part of the XMLA command’s parameters collection. Historically one of the biggest issue with parameters in DAX (and MDX) has been the client tool support. From what I have experienced, they are really only used in Reporting Services reports. However with the addition of “paginated” reports to the PowerBI.com we may start to see a resurgence of these types of reports. 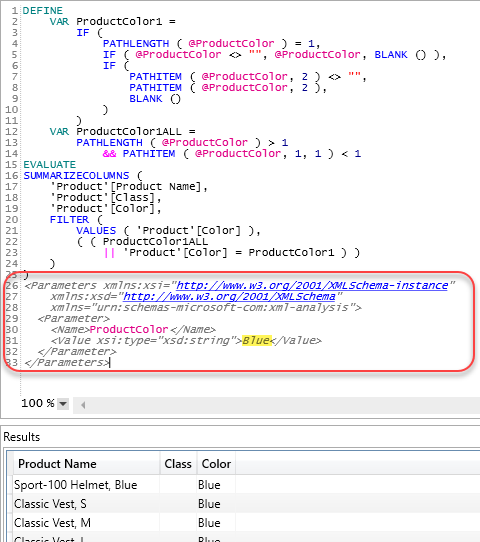 Then when your run your report the value for this parameter gets injected into the query as a string value. 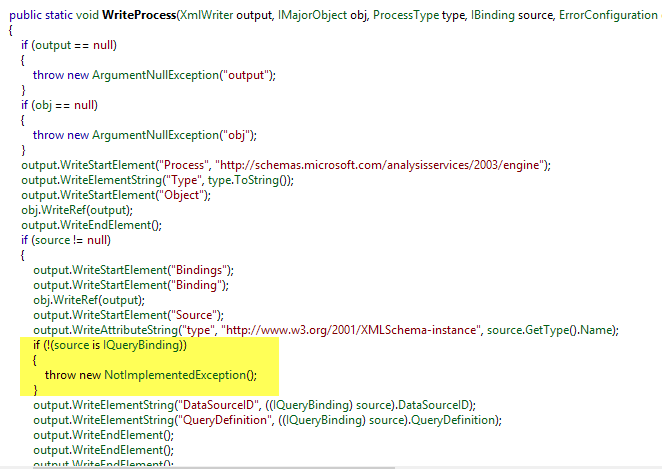 This is all fine within the SSRS designer, but what happens when you need to do some performance tuning on the query? If you are using a tool like SSMS then you have no choice but to do a find and replace on the query text and replace the @ProductColor value with something like “Red” to test your query, but then you need to make sure to do the reverse of this operation before pasting your final query back into SSRS. This is a bit of a hassle with one parameter, but it can be a real pain and potentially error prone if you have 10 parameters? Well for a couple of years DAX Studio has supported XMLA parameter blocks so that you could run queries like the following. However the XMLA parameter syntax is a bit arcane and not the easiest thing to remember, but if you have an example to start from it’s not too bad. Why did we choose the <Parameters> XMLA block as a format? Well if you create a trace using SQL Profiler that listens for QueryBegin events you will see text exactly like the query in the screenshot above, with the text of the query followed by the XMLA parameters block. This made it possible to capture SSRS queries from a SQL Profiler trace and then just paste the straight into DAX Studio and execute them. As of DAX Studio 2.8.0 we introduced a new Parameters Dialog, this should be triggered anytime you run a query that has parameters in the query, but no XMLA parameters block. 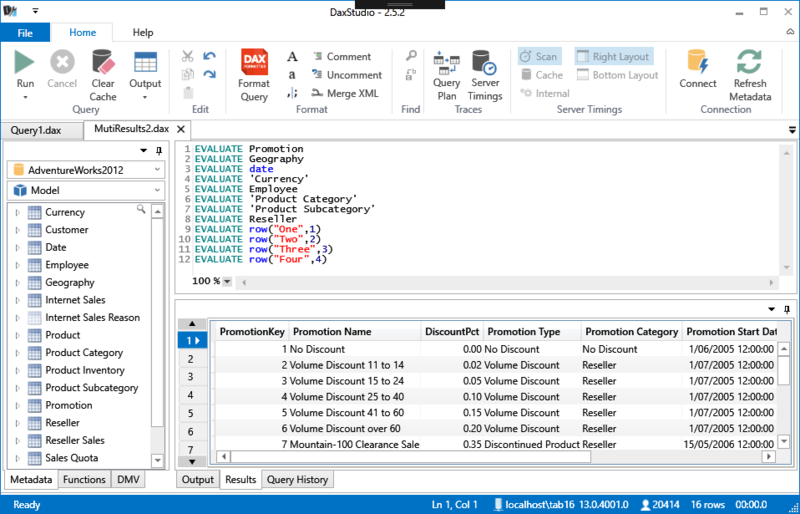 You can then run the query multiple times, filling in the value of the parameters each time. Or you can click the “Write Parameter XML” button in the bottom left to generate an XMLA parameter block. 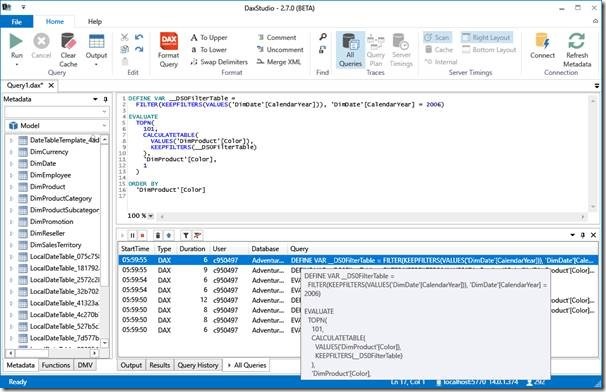 This will generate and XMLA parameter block and insert it underneath the query and then you can re-run the query multiple times without having to enter the values into a dialog box each time. 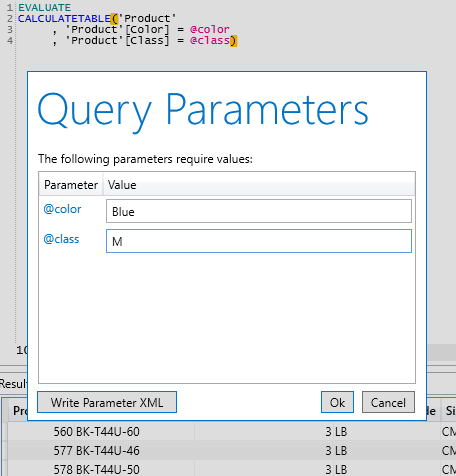 In addition to the ability to run queries with XMLA parameter blocks we also have the “Merge Parameters” button on the ribbon which will take an existing query with a parameter block and merge the parameter values into the query. So now with DAX Studio you have an easy way of working with parameters in DAX queries. Either for working with queries generated by the SSRS query builder or even just as a way of running your own queries with a range of different parameters. So the problem below was in relation to working with dates from a Sharepoint 2013 List, but the same technique should be applicable any time you want to convert UTC/GMT datetime fields to a local time. When Sharepoint exposes datetime values from lists using its REST API it converts them to the UTC timezone. I suppose a lot of the time this makes sense, specially if you are dealing with data entry across multiple time zones. But if you are just working in a single timezone this can be frustrating to deal with. The with bringing this data into Power BI is that the column in Power BI does not get tagged as being UTC which can lead you to think that something has gone wrong. 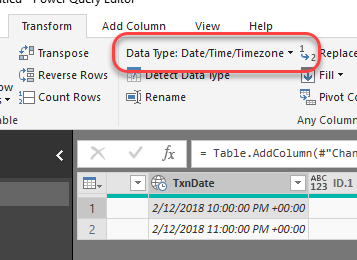 Because if your are in any timezone other than GMT you will see dates/times being offset when you bring them in to Power BI. I live in UTC+10 so this effect is quite marked often shifting dates back to the prior day. If you look at the data from the Webservice calls to Sharepoint you can see that it’s returning the dates in UTC format, not as they were entered in the UI. The images below show you an example of this. 3. 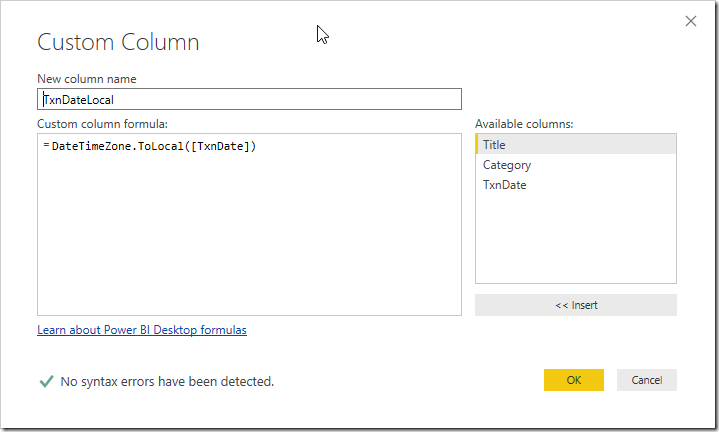 Show how the data appears in Power BI, which is how it was sourced from the Sharepoint REST API. 3. Repeat the above for each DateTime column and then use the “local” versions of these column in your model. It’s probably also a good idea to go back and delete the original version of these columns from the query after we have added the new local versions to prevent them being used accidentally. When you run a query in DAX Studio with the Server Timings feature switched on you will see output like the following. A number of the metrics that are gathered by the server timings have been abbreviated and if you may not be aware of what they all mean. The topic of performance tuning DAX queries can get quite involved. This post is just designed to give a brief overview and bit of background about how the different metrics are calculated. You may also wonder what that “SQL like” query is that captured by the scan event. This is called xmSQL and is textual representation of the requests that the Formula Engine sent to the Storage Engine. As far as I am aware there is no way of executing these queries, they are merely a textual representation of the requests sent to the Storage Engine to enable people to understand what operations the storage engine was performing. The major change in this version is to the tracing engine. We’ve introduced a new trace type and made some changes to the way the tracing windows operate and incorporated some enhancements to crash reporting and enabling logging. Previously when you clicked on a trace button, the window opened and the trace was started and when you switched off the trace the window closed. The running of the trace and the visibility of the window was closely linked. In v2.7 we have removed that tight linkage, when you click on a trace button the window opens and the trace still starts as it used to, but when you switch off the trace the window now remains open. The table below shows the 2 new states that trace windows now have. All trace windows now have a number of additional controls in their title area. The tabs for the traces now also have an indicator to show their state so that you can see the state of a given trace at a glance. In the image below you can see that the All Queries trace is stopped, while the Query Plan trace is running and the Server Timings trace is paused. Note that while a trace is paused the server side trace is still active it’s just the DAX Studio UI that is paused, so expensive trace events like Query Plans can still have an impact on the server. The new trace type is called “All Queries” – which captures all queries against the current connection, regardless of the client application. This is useful for capturing queries from other client tools so that you can examine them. The “All Queries” trace has a few additional buttons in the title bar area. 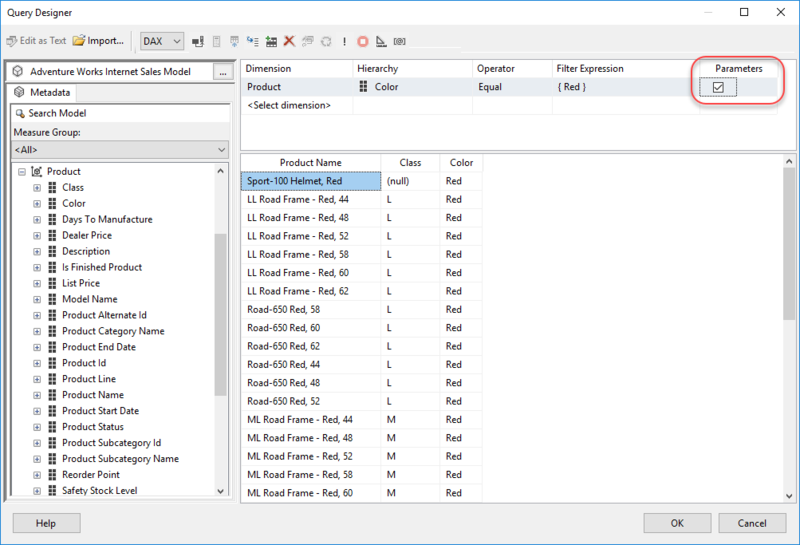 The following button in the trace window title will copy all the queries matching the current filter to the editor pane. The Filter button shows and hides the Filter controls, the clear filter button will clear any filter criteria from the filter controls. Filters can be set for a specific type of query DAX/MDX/SQL/DMX, for a duration range, username, database or query. The filter all do a “contains” style search that matches if the text you type is anywhere in the field. 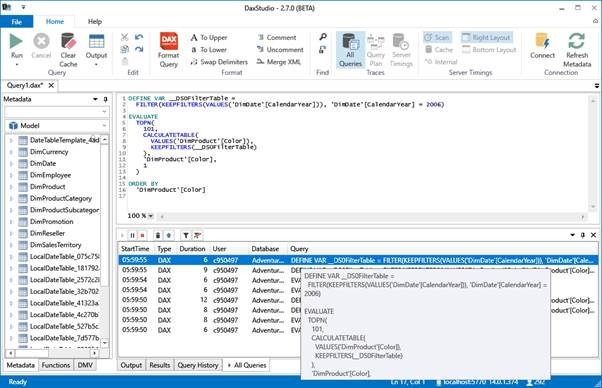 Note: You cannot have the "All Queries" trace running with either the Server Timings or Query Plan traces as DAX Studio currently only runs one trace session per query window and these traces apply different filters to the trace events. We expect that the normal workflow would be to run the All Queries trace and collect a set of queries. Then you will stop the All Queries trace and look at the long running queries, maybe re-running some of the captured queries with one or both of the other trace types to help isolate performance issues. The amount information in the tooltips for columns has been greatly extended. By default we now show the format string, min and max values, the number of distinct values and a sample of 10 values. There are now settings under File – Options that let you turn off either one or both of the basic statistics or the sample data information in the tooltip. We’ve added the CrashReporter.Net component that will catch fatal crashes and give the user an option to submit a crash report containing the exception message and stack trace information that may help us resolve the issue. 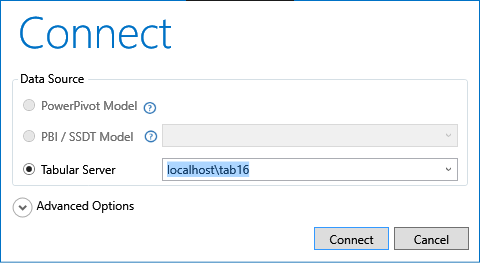 We also now support a logging hotkey – holding down the left SHIFT key while starting up Excel or the DAX Studio standalone will start debug level logging. There is a link in the Help – About dialog that will open the log folder or type Win+R then enter %APPDATA%\DaxStudio\logs and click open or put that address into the address bar in Windows Explorer and hit the enter key. Added installer support for the SQL 2017 versions of AMO and ADOMD – if you have both of these the installer should no longer insist on downloading the 2016 versions of these libraries. And both Firefox and Edge give you very scary warning, but will let you download the file. The advice on the Chrome "learn more" link is very generic and there does not appear to be any way of submitting for a re-assessment of this judgement. I checked both the original file and then downloaded the file from codeplex and checked again (just in case something had infected the file after it was uploaded to codeplex) using Googles virustotal.com site and both times 0 out of 55 antivirus scanners reported any issues. The latest release of DAX Studio has a couple of new features as well as a bunch of small fixes. The biggest single feature is the support for multiple result sets. 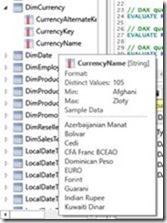 Both SSAS 2016 and Power BI support sending multiple EVALUATE statements in a single batch. You can now do the same thing in DAX Studio and we will generate a numbered tab for each result set. We've changed the Connection dialog so that connection types that are unavailable are just disabled instead of being hidden. There is also a little help icon with a tooltip which indicates why the particular option is disabled to help those that are new to DAX Studio. 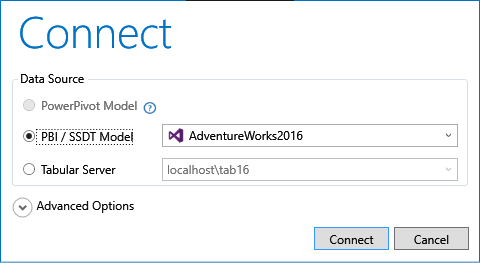 We've added the ability to connect to SSDT Integrated Workspaces. There is now a setting under File – Options to allow you to opt-in for notifications of pre-release builds. So when you launch DAX Studio if there is a new pre-release version available you will get a toast notification. I don't think we will always do a pre-release build, but there have been a number of times where it would have been nice to get a few more people testing out new functionality before doing the final release. When querying measures the Formatting from the data model is now applied. Note that to do this we look for matches between the column names in the result set and the measures in your model. So if you use functions like ADDCOLUMNS or SUMMARIZE you need to make sure to give the output columns the same name as the underlying measure if you want formatting applied. A link has been added to the dowload page from Help - About when a newer version is available. Added parsing of record counts in Server Timings for SQL 2016 / Power BI Desktop. Improved metadata search performance and the search box now stays open when it has keyboard focus. Fixed an issue where Query Plans and Server Timings would not start when connected PowerPivot. Fixed an issue with hidden animations running causing background CPU usage even when the app was idle. Fixed crashes when refreshing metadata (also affects the automatic refresh when switching back to DAX Studio after editing your model). Fixed PowerPivot connections so that they stay connected when you open another Excel file. Note: In this release we have updated the versions of the Microsoft ADOMD.Net and AMO libraries we reference to use the SQL 2016 versions. This gives us scope to access some of the new functionality in Power BI and SQL Server 2016, but may mean that you are prompted to download these when you upgrade from a previous version. There is now an option under File > Options where you can enable extra events in Server Timings for Direct Query based models. These events add extra overhead so you should only enable this option before you start tracing a Direct Query model and you should disable this option once you are finished. Earlier versions of DAX Studio contained a hard coded list of syntax highlighting keywords and functions. The lists of keywords and functions used for syntax highlighting is now dynamically discovered from the data source. This has advantages when dealing with Power BI in particular which can get new functionality added from one month to the next. 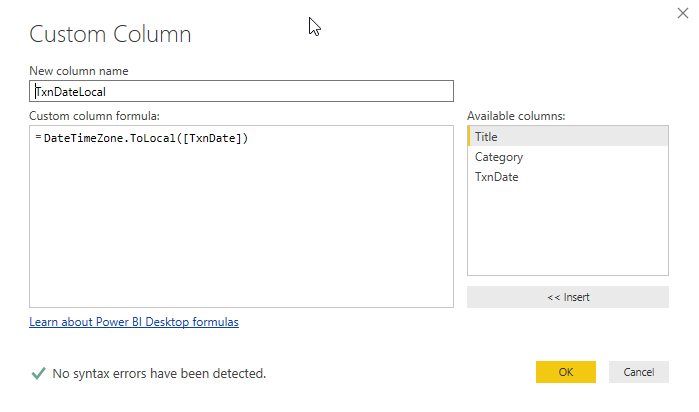 Analysis Services 2016 and Power BI have added information to the server timing events that includes information about the number of rows and the size of data returned from each of the timing events. If this information is found it is now surfaced in the server timings tab. The old version of the DaxFormatter.com API required a second call if there was an error to find out the details of the error. The nice people at DaxFormatter.com have updated their API so that this is no longer necessary. In the 2.4 release we introduced an option where you could convert on demand between the 2 different separator styles. But all queries had to be executed using the UK/US style. The UK/US style is where a comma (,) is used as the list and thousands separator and the period (.) is used as the decimal separator. The European/Other style is where a semi-colon (;) is used as the list separator, the thousands separator is a period (.) and the comma (,) is used as the decimal separator. Now you can choose which style you want to use as your default in File > Options menu. Prior to this version if you clicked on an entry in your recent file list which pointed to a file that had been renamed or deleted you would just get a blank window with no idea what went wrong. Now there will be an error posted to the output window tell you what went wrong. A toggle delimiter feature has been added to switch between regional settings styles (commas vs semi-colons). Currently queries still need to be executed using the "US" style comma delimiters, but if you have expressions using semi-colon delimiters then you can easily switch back and forth. This can also be handy if you find an example expression online that is using different delimiters than what you have in your model. The loading and caching of intellisense data has also been vastly improved. The slightly delay when starting to type a query against a large model should be gone and you should also not see issues when trying to edit a query in a window that is currently executing a query. 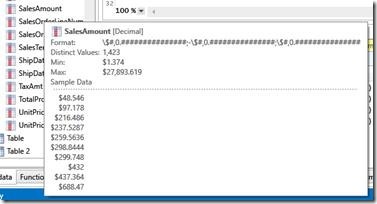 Often when you have a requirement to show a measure for the TopN of a given attribute the users will want to see the subtotal of all the other items. With multi-dimensional cubes and MDX you can create calculated members in a dimension. But you can’t do this in a tabular model using DAX . You could create a calculated column, but then your TopN would be fixed and could not respond dynamically to changes in filters as calculated columns are calculated and stored at processing time. So one way to make this work is to have a placeholder row (or rows) with "Others" in the table which you are doing the TopN over. The first step in this technique is to create a Rank measure (this saves having to re-type the rank logic multiple times). In this example I’m doing a top 5 Brands. Then if we create a pivot table with this measure we get the following result. 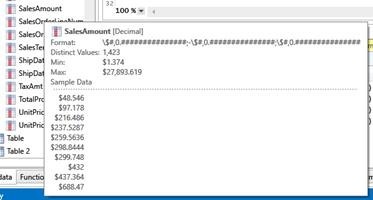 In the picture below I’m showing the raw Sales amount so you can see how the amounts get re-assigned in the Top5 calculation. This also works as you change the pivot table. When we introduce the Segment on the rows we can show a figure for “Others” within each segment. (Note that for this to work I had to create 2 placeholder “Others” rows, one in each segment). There is a link at the bottom of this post to the file that these screenshots were taken from. The modified version of the calculation has a much better performance profile, taking about 1/3 of the time and with an almost 50/50 split between the Formula Engine and the Storage Engine.